Your intestines are home to trillions of bacteria cells that need your help to stay in balance. HCP®150 offers all the health promoting benefits of HCP®30 and HCP®70, but at a maximum strength potency for times when a more therapeutic dose has been recommended, or when critical support is required on a temporary basis to restore proper gastrointestinal balance. This Critical Support formula, when taken as directed, provides 150 billion active cells per day. It features 6 human strains that implant healthy flora throughout the entire digestive tract. It has also been cryoprotected and a family of stabilizing support nutrients has been added to help ensure the viability of the flora. Consume 1 capsule after breakfast and 1 capsule after dinner for a total of 2 capsules per day. After 6 months of continuous use, you may reduce the dosage to 1 capsule per day with the meal of your choice. Keep refrigerated whenever possible. HCP®150 provides 150 billion active cells (per 2 capsules) at time of expiry. Current research has shown that probiotic formulas with more strain variety and higher potencies offer greater activity and overall health benefits. HCP®150 contains 100% human strains. Human microflora is, by far, the most compatible with your digestive system. It has the ability to colonize and multiply within the gastrointestinal tract whereas other forms (dairy and plant) sometimes fail to stick to the intestinal wall or simply die off after ingestion. HCP®150 is specifically designed to inhabit and protect the entire length of the GI tract. The Lactobacilli (Rhamnosus, Acidophilus and Salivarius) primarily colonize within the small intestine, while the Bifidobacteria (Breve, Bifidum and Longum) are most prevalent within the large intestine. Consideration was also given to ensure oral and vaginal probiotic health. HCP®150 Probiotic is manufactured using a cryoprotective process that ensures the viability of the flora. This cold temperature process removes all the available moisture and microencapsulates the strains for optimum stability. It is further enhanced by the addition of a family of stabilizing support nutrients that contribute to the longevity of the active cells. Some debate exists on whether enteric coating a probiotic supplement will reduce the amount of gastric damage following ingestion. Fermented foods have been acting as our primary source of dietary probiotics for centuries without being enteric coated. As well, enteric coatings typically use a polymer of acrylic acid (a synthetic chemical) which conflicts with HCP®150 Probiotic's all natural approach. During a meal our stomach pH increases and becomes more alkaline (between pH3 and pH4.5). The strains in HCP®150 Probiotic are acid tolerant and can be exposed to a gastric solution in this range without suffering any bacterial loss, eliminating the need for enteric coating. 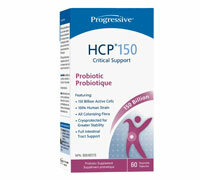 We simply encourage you to take HCP®150 Probiotic with food.